I always visit bookstores wherever I travel. Bookstores with multiple levels are such a great combination! The most literary place I've ever visited? Can I count Archer City, TX because of Larry McMurtry's bookstores? The second one would be…oh, damn, I'm blanking, but the University of Iowa is there!! Clearly, I need a literary vacation! Brian — I've become hooked on the bookstore & library visits. It's familiar turf even when I'm somewhere completely new and different — and I love seeing the way they do things slightly differently. Bybee — Archer City, absolutely! 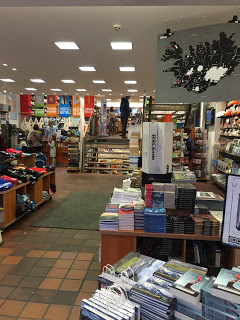 When I first heard about McMurtry as bookstore owner, I could hardly believe it. Way too cool. I think we all need literary vacations… and lots of them.